figure 15-7 Schematic description of the role of renin in the production of angiotensin I (not a hormone) and angiotensin II (a hormone). their actions on ion balance principally in the kidney, but also to some limited extent in the salivary glands, gut, and sweat glands. In the kidney, the actions of the mineralocorticoids result in increased cortical collecting tubule reabsorption of Na+ with a concomitant secretion of K+ and H+ (as ammonium). Only a fraction of the Na+ filtered by the glomerulus is actually reabsorbed as a consequence of aldosterone action; however, this fraction can effect significant consequences on electrolyte balance. After aldosterone is secreted from the zona glomerulosa of the adrenals, it enters the circulation and reaches the kidney mucosal cells which concentrate aldosterone. Figure 15-9 summarizes the series of aldosterone-mediated responses which occur in the kidney collecting duct cells. This includes induction by the aldosterone-receptor of at least three proteins; these include (a) a Na+ ion permease enzyme which increases the number of atoms of Na+ entering the mucosal cell from the urine, (b) an increase in the amount of citrate synthase in the mitochondrial matrix; and (c) an increase in the levels of the Na+,K+ ATPase which is responsible for pumping Na+ from the cell cytoplasm on the peritubular side of the cell into the peritubular fluid. FIGURE 15-8 Receptor model stimulation of aldosterone biosynthesis. 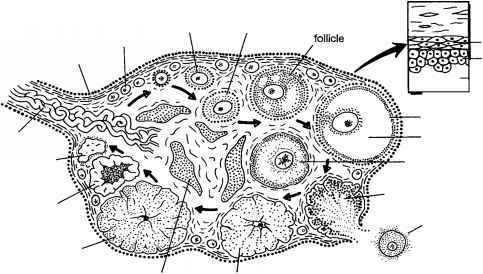 Receptor-mediated effects leading to aldosterone production by the adrenal zona glomerulosa cell. Illustrated is the acute stimulation by agonists to increase the first step in aldosterone biosynthesis, which is likely mediated by the StAR cholesterol transport protein (see Chapter 2) that delivers substrate to the P450scc enzyme. 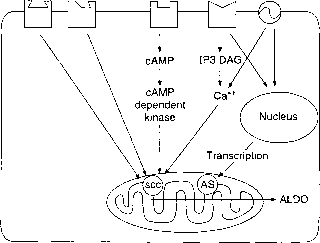 Abbreviations: A-II, angiotensin II; ANP, atrial natriuretic protein; AS, enzyme associated with synthesis of aldosterone (see Table 2-6); K+, K+-modulated voltage-gated Ca2+ channels; SCC, side chain cleavage of cholesterol. Modified from Mortensen, R. M., and Williams, G. H. (1995). Aldosterone action: Physiology. In "Endocrinology" (L. J. DeGroot et al, eds.) 3rd ed. Vol. 3, pp. 1668-1676. W. B. Saunders, Philadelphia, PA.
Na+ uptake into the renal tubular cell; this represents a nongenomic action of the steroid.